Hormel has a variety of crowd-pleasing solutions for parties or meals for you & your family. Easy, on-the-go snacks or sit-down meals & recipes. Hormel Natural Choice’s mission is to make a lunchmeat that has no preservatives and no artificial ingredients added, and that’s both enjoyable and affordable. That’s easy to find and easy to understand. Read our bloggers’ posts and see for yourselves how Hormel Natural Choice lunchmeats have inspired them to create fun, easy and delicious family meals. The Natural Lunchmeat Blog Sweepstakes on SheKnows runs from 4/13/2017 through 6/30/2017 and is only open to individuals who, at the time of entry deadline, are legal residents of the United States and are 18 years or older. Click "here" to read the official rules. Winners will be randomly selected from all eligible entries. Good luck! Hormel has a variety of crowd-pleasing solutions for parties or meals for you & your family. Easy, on-the-go snacks or sit-down meals & recipes. 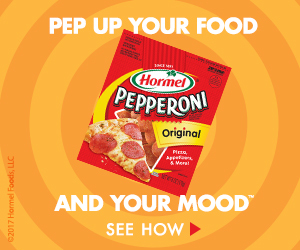 Read our bloggers’ posts and see for yourselves how Hormel Pepperoni has inspired them to create fun, easy and delicious family meals.